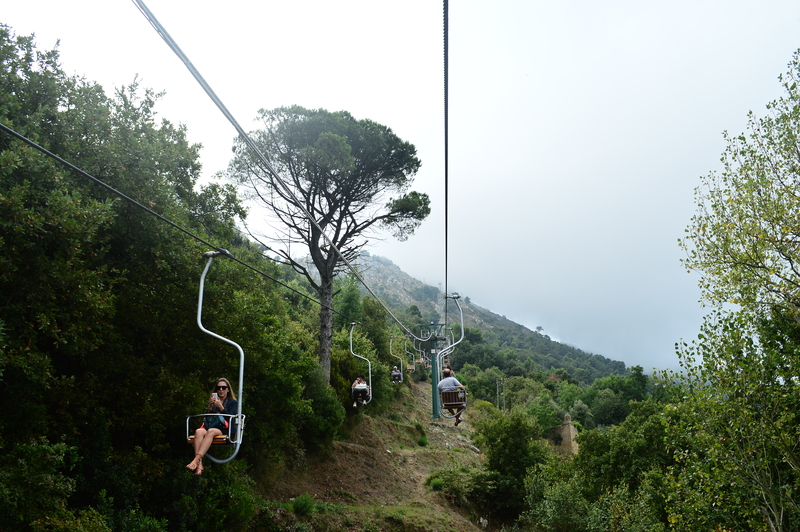 We were in a hurry to get to Capri. 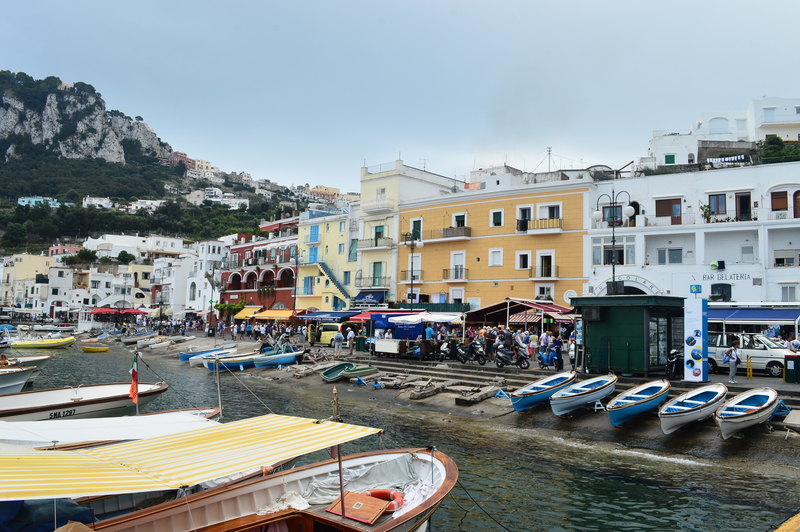 While standing in line in the Sorrento harbour, waiting for our turn to buy the tickets alongside a large group of other tourists, we were anxiously glancing from the line over to the catamaran that was apparently already starting its ride and wondering whether we will make it. 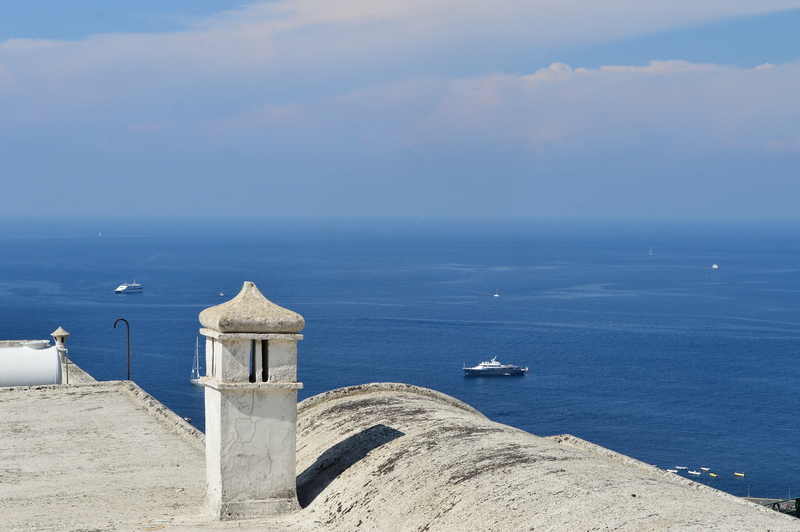 We were being ridiculos, of course, because boats, water taxies and catamarans were traveling from Sorrento to Capri really often and our inability to get on board of this one would maybe impede our arrival to the island for 10-20 minutes. 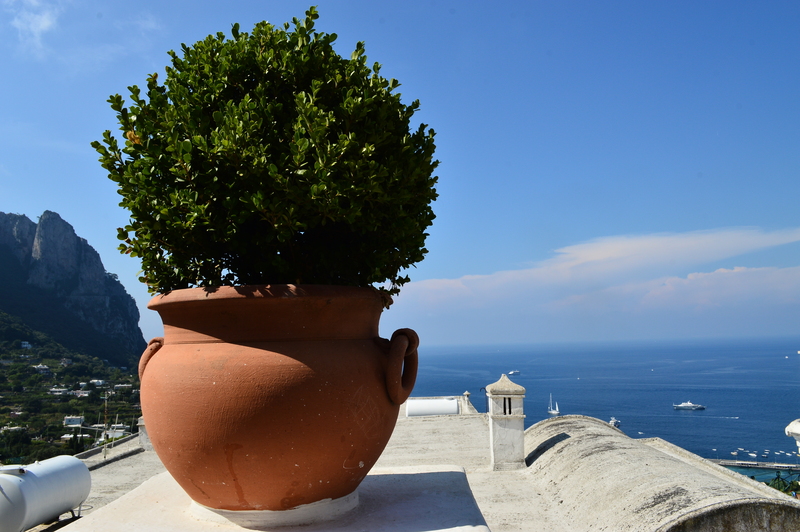 But we couldn’t wait so long, filled with impatience about visiting the island described so often as an island of myth, history, poetry, art and good living. 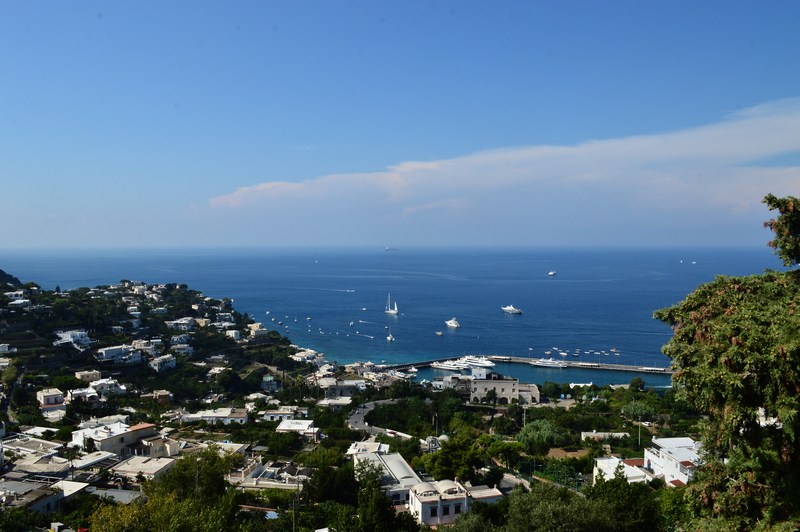 We needed to know – and sooner rather than later – whether the hype was justified and whether we will love Capri as much as everyone else apparently does. 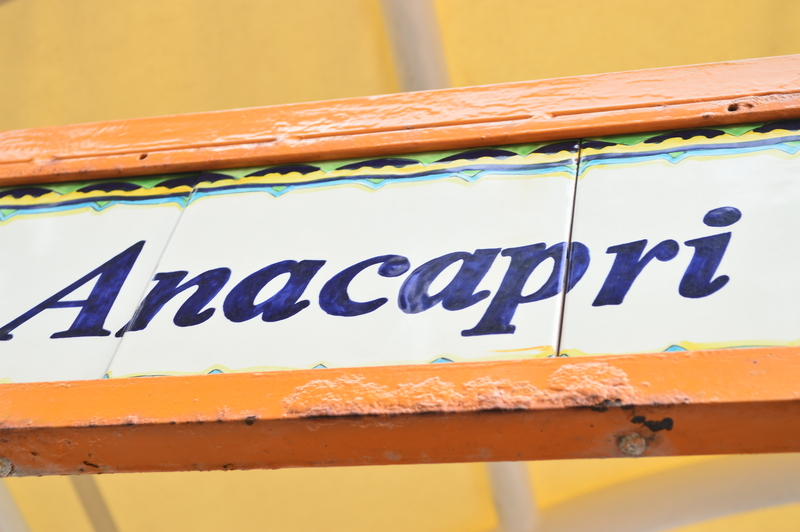 Visiting any island is always exciting, it feels as if you are embarking on a real adventure. 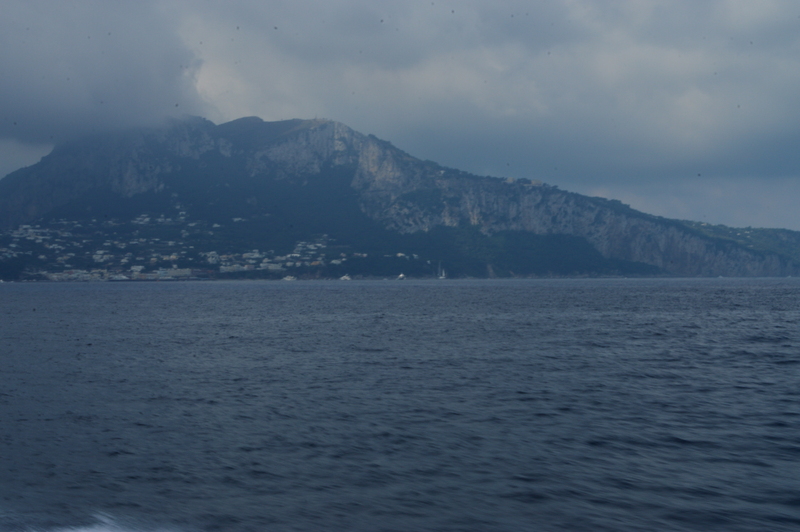 Arrival to the destination is in a way out of your control and all you can do is stand impatiently on the boat and observe the piece of land approaching you. You can’t hurry it up which is why excitement in you grows, escalating to almost unbearable heights once you enter the harbour and you have to wait for the boat to anchor, which usually seems to take irrational amount of time. 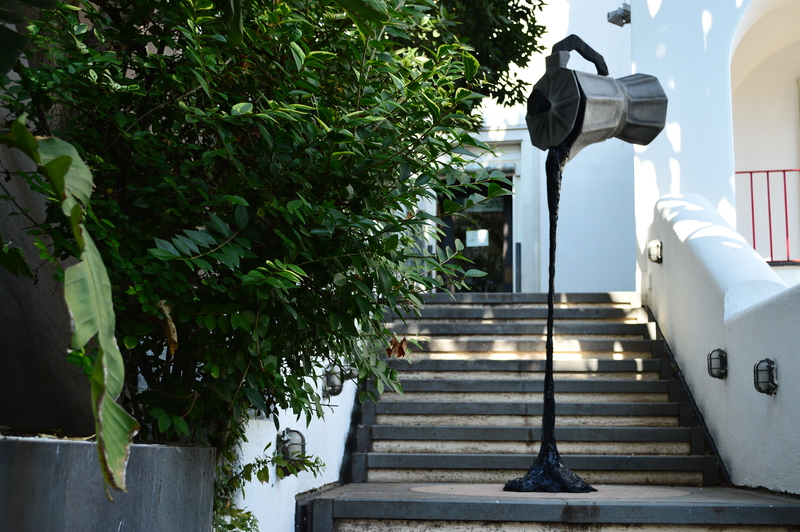 Or, at least, this is how I felt while waiting for our catamaran to anchor in Capri’s Marina Grande, shortening my wait with looking what was going on in the Marina – boats lulling in the water, their shapes and colours reflecting in the clear water, whitewashed facades of weathered houses and souvenir shops, locals waiting with an ardent eye for a new “batch” of tourists to take around the island and occasional high towers of grandiose villas in the distance, reminding me of the fact that we are on an island synonimous with high-class, luxurious living. 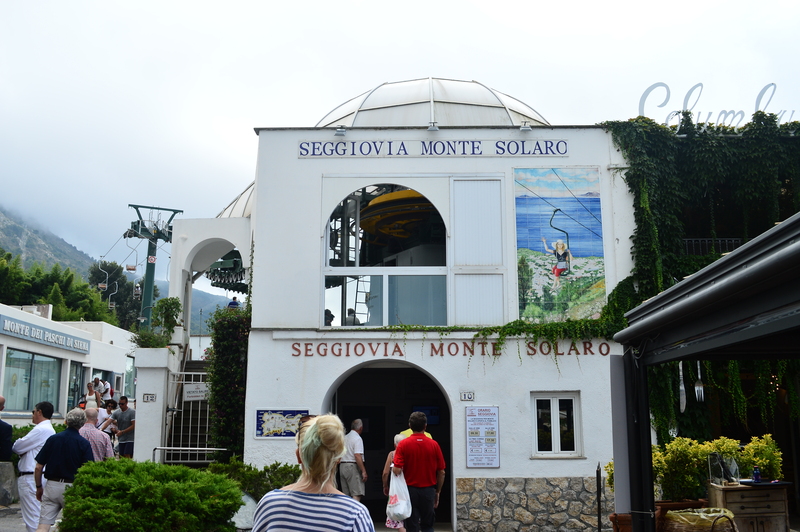 The first planned stop of our tour of the island was Monte Solaro, the highest peak of Capri at 589 m and a beautiful spot to take in the entire island and the 360 degrees of pure natural beauty that blesses it. 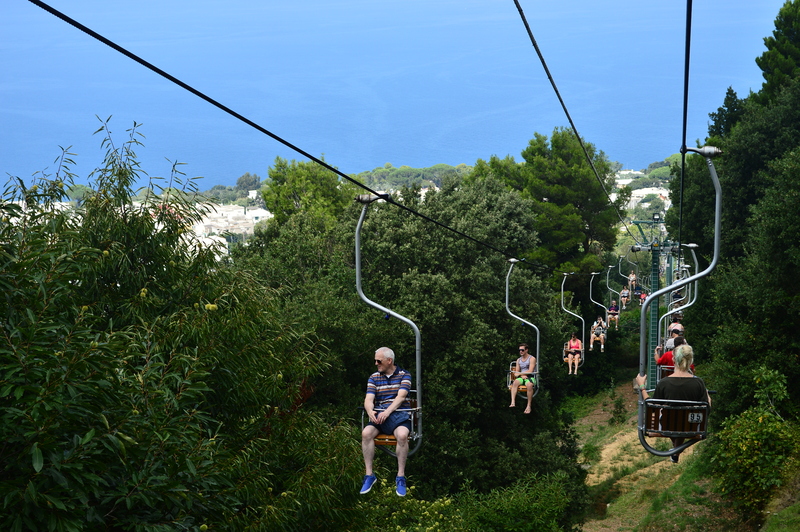 However, in order to get to the peak of the island, we had to take what at first seemed a scary ride on a funicular climbing up to Monte Solaro from Anacapri. 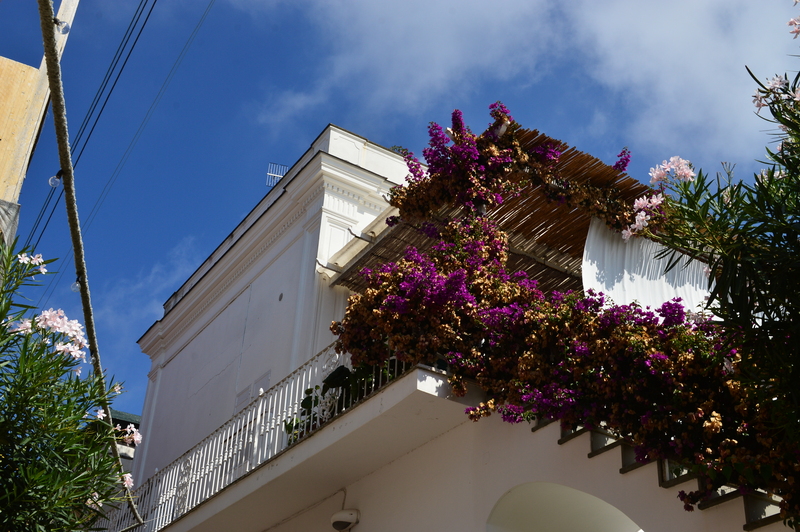 Thin steel handles and wooden baskets that were meant to transport us up did not feel too safe, especially when we realized that even the smallest gush of wind would move our baskets like we were light puppets. But, once we relaxed, and in a longish drive we were bound to relax sooner or later, we could give ourselves the opportunity to stop fretting and start enjoying what we could see around us. 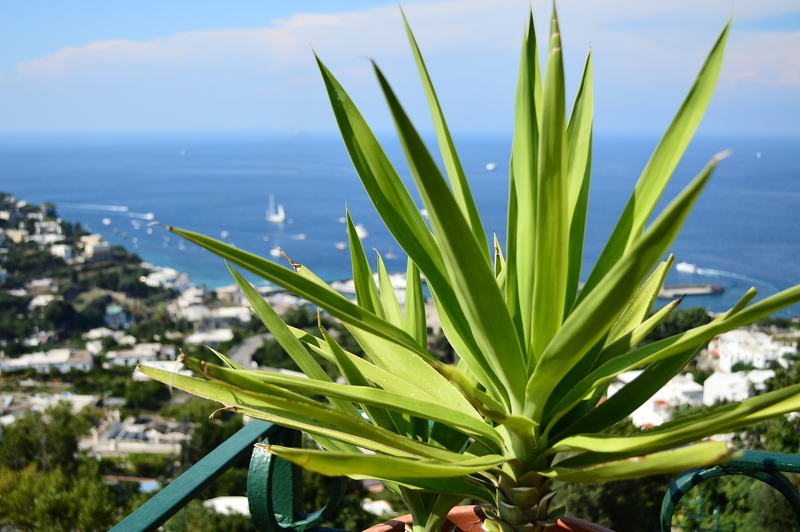 Nature in all its glory – witnessed in the glow of the early morning sun above us, tidy houses and cultivated gardens filled with vines and lemon trees below us and the amazing blue expanse of the sea as far as our eyes could see. As we climbed further up, the sun was replaced by a thick mist and our ride turned into a mystical journey towards the sky and the rocky formations whose outlines we only occasionally managed to see. 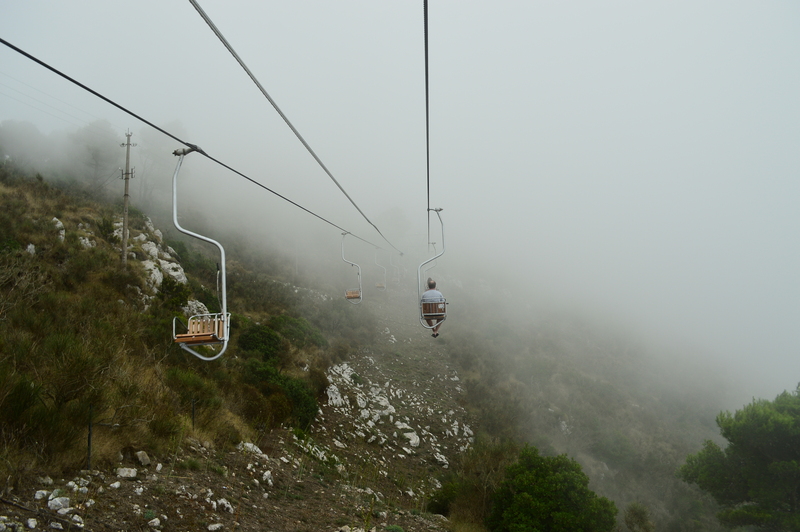 Up we went, through the mist and the mystery, not really knowing what we could expect, and that didn’t even change once our feet finally touched the solid ground at the end of the funicular on the top of the island. 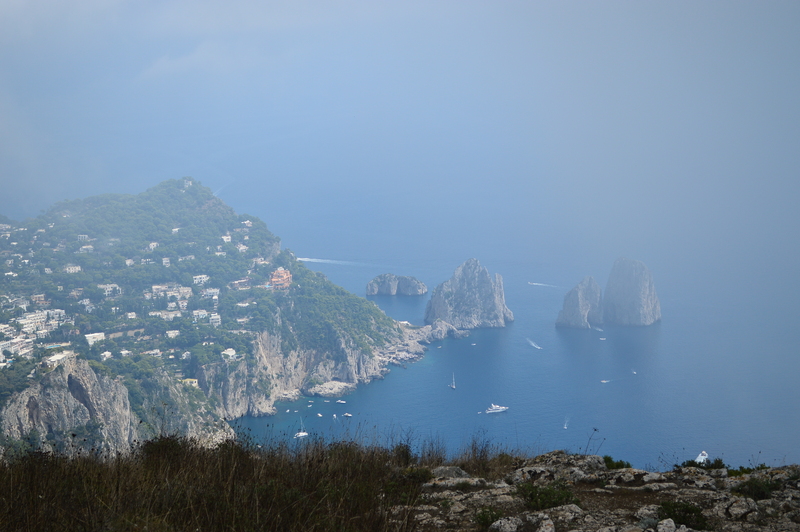 The mist was so thick that we were unable to see anything surrounding us, but all we had to do is be patient and wait for the sun to break through and allow us to see Capri from its peak and the sea that surrounds it. I could have stayed up on that top forever, breathing in the crisp fresh air and just admire the views and the beauty surrounding me that was changing constantly, as a result of an interplay between the sun and the mist. 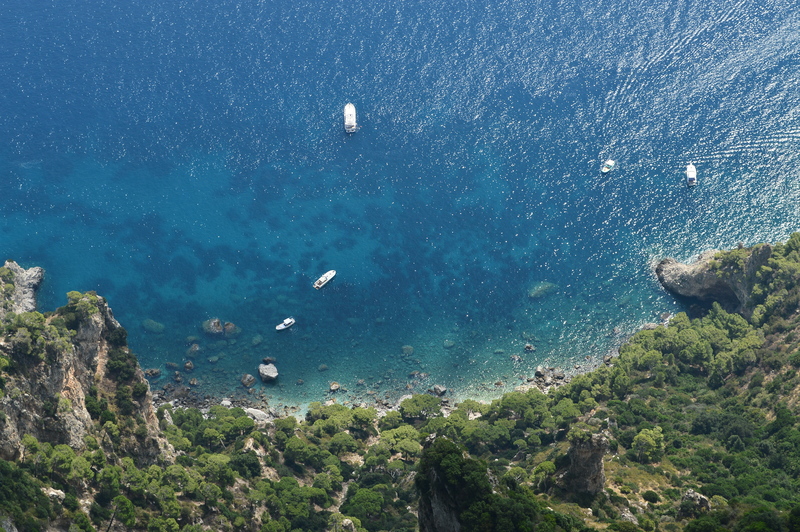 From its top, while I was taking in the greenness of the vegetation, the gold of hidden beaches only approachable with private boats, and the million shades of blue of the sea, Capri really appeared as a mythical form in the sea: a land of myth, mystery and beauty where everything was possible. 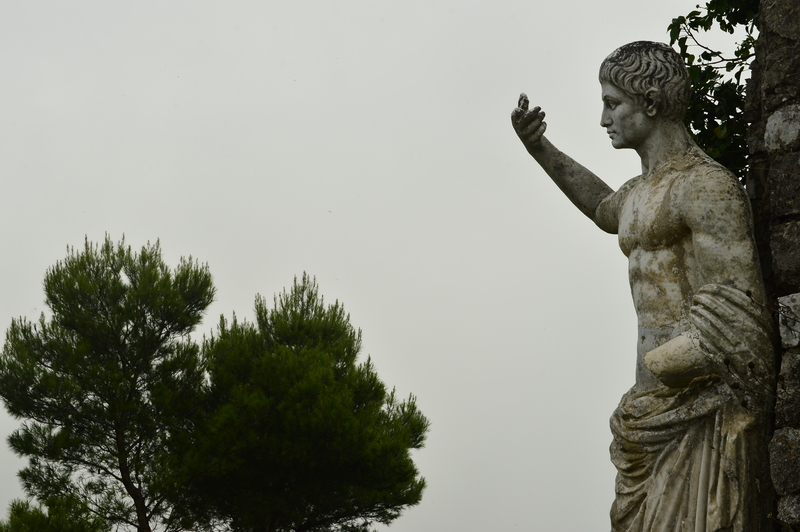 I almost expected to see syrens resting on glimmering rocks in one of the island’s bays or some other mythological creatures enjoying themselves in the beautiful nature of the island. 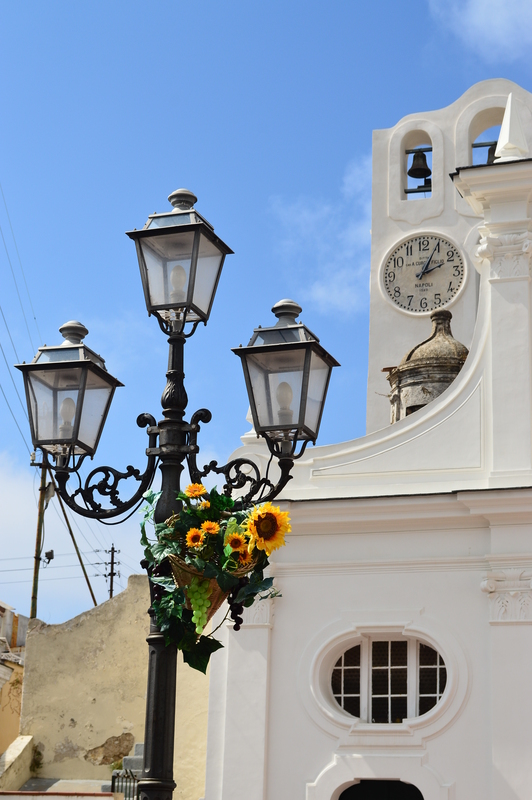 After a ride down with the funicular from the Monte Solaro, it was time for a visit to Anacapri, one of the two main towns of the island. 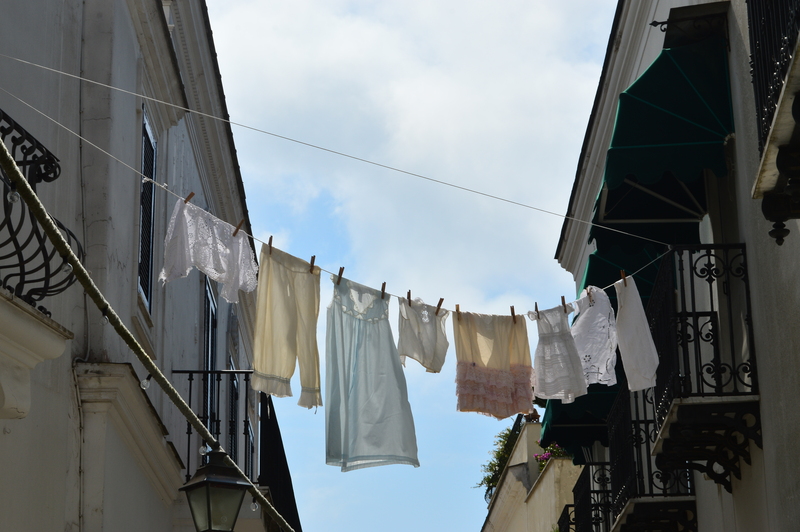 Its reputation of a tranquil, pictoresque place where life is simple and carefree seemed to be well deserved. 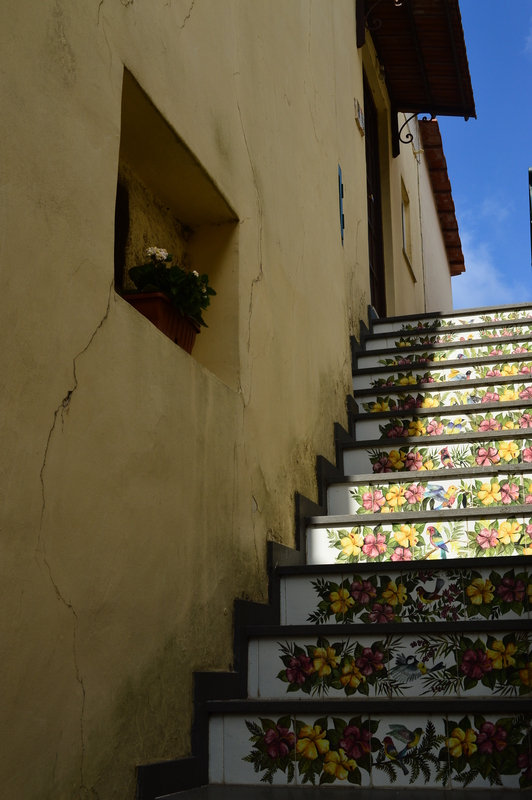 White houses surround narrow pedestrian streets and everywhere we looked we could see pines, lemon trees and colorful flowers decorating beautiful shaded terraces, as well as wonderful artistic details of decorative tiles placed on the floor or inserted into the facades of houses. 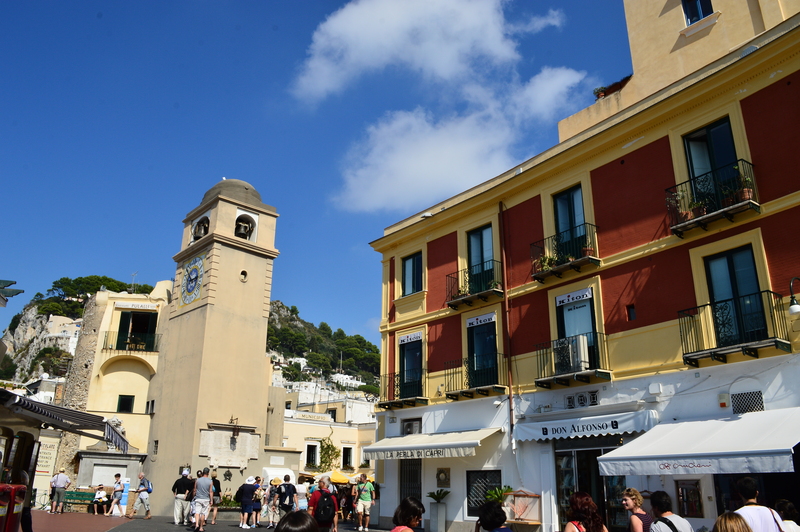 Anacapri really is a picture-perfect little town, very tidy and artistic, in which you feel no other need than to wander through tiny alleys or just sit on a bench and watch the world go by, lost in the images and your own thoughts. 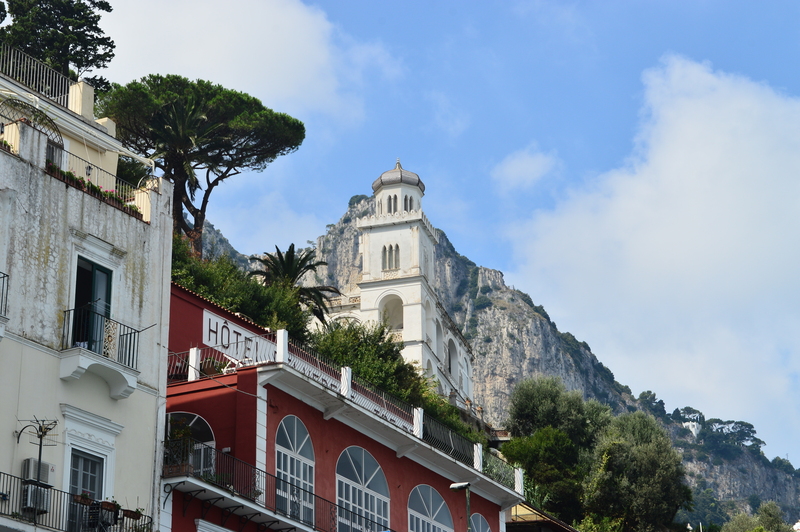 After wandering through Anacapri, we went on to the town of Capri, boasting with a completely different atmosphere – where Anacapri was tranquil, Capri felt hectic and dynamic, where Anacapri felt simple and straightforward, Capri was lush, elaborate and exclusive. 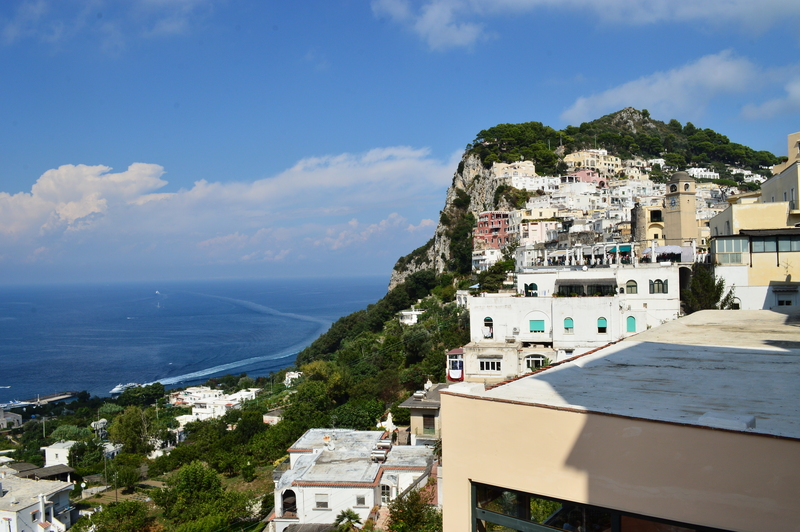 After all, this is a town for the rich and the famous, something that can easilly be witnessed in numerous expensive shops, artisan gelaterias and exclusive restaurants with terraces hidden with bouganvillia. 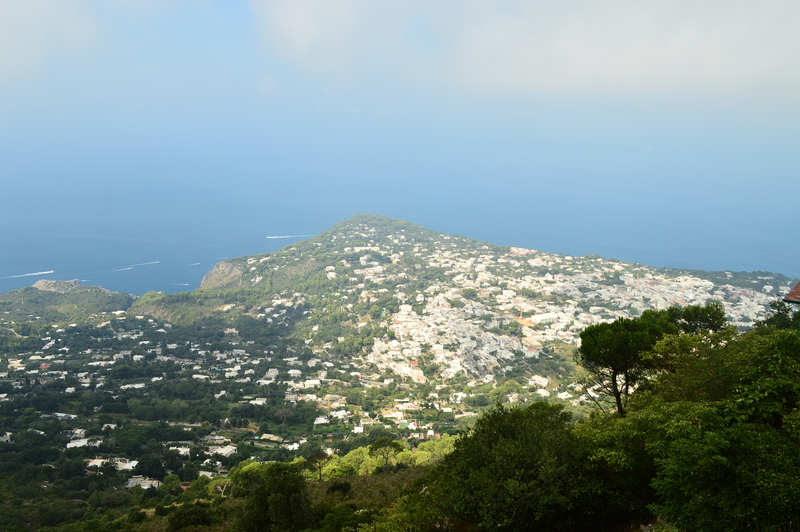 Still fulfilled with the beauty of sights on Monte Solaro and unpretentious air of Anacapri, we didn’t feel the need to stay in the town of Capri for to long, realizing that, without the wish to shop for haute-couture or extravagant jewelerry or the need for exclusive dining, we were left short of the things to do in the town. Before leaving, however, we had to brace ourselves for yet another spectacular experinece, one of real dazzlement and hypnotization. 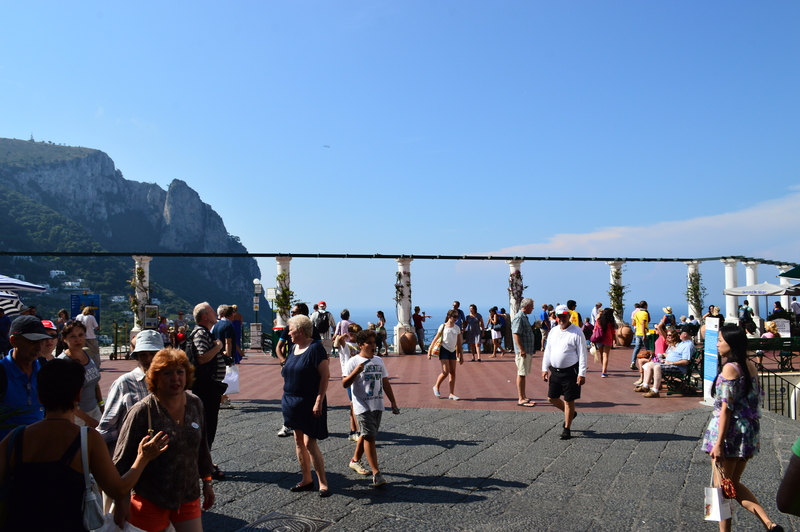 This was the view from the main town square, La Piazzeta, which rather than a square looks like a giant terrace of an exclusive villa offering unbelievable views of the azzure sea bordered by elegant white arches of the square decorated with flowers and unimposing benches offering a chance to rest if you get too shaky from the majesty of the view in front of you. 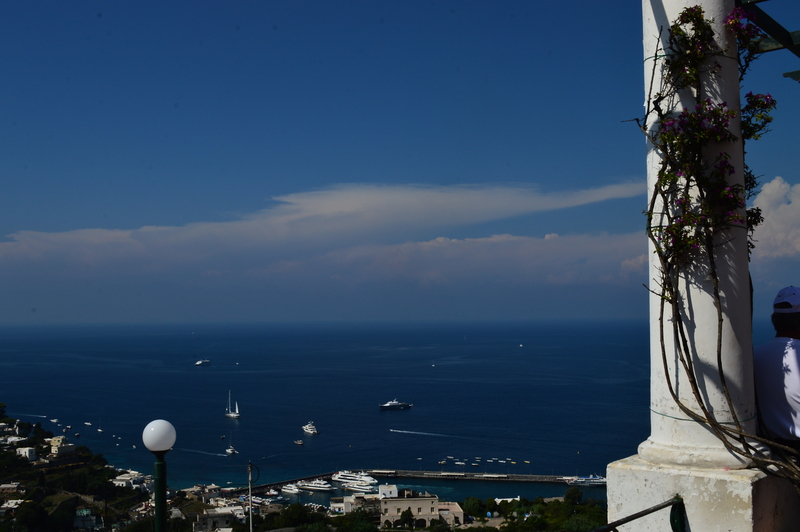 And as we were overwhelmed by the beauty in front of us, for that time we were standing on the edge of La Piazzeta and looking down on the villas on the land and yachts forming fuzzy lines on the sea, we felt not only rich, but almost godly.